The following is a list of things I have honestly done while extremely tired. – Spent an entire day contemplating how awesome the words “Tuna fish” are. – Strongly considered peeing in the litter box belonging to a friend’s cat. – Apologized to a fire hydrant after bumping into it. – Wrote a story about being felt up by a large, orange tree in my bathroom. – Slept through most of my Travel and Tourism course, but not in the way that would’ve made me a legend. – Said the word “Horses” like 17 million times one day. – Tried to start writing a book roughly 20 or so times now. I have yet to make it past 500 words. – I honestly don’t remember the ending to so many video games since I’ve beaten them in a state of partial awareness. – I slept through the last 15 minutes of ‘No Country for Old Men’! I have yet to see what happens. Please don’t spoil it for me. I really must get around to seeing it again at some point. – I honestly tried to pick up someone once by going on a ramble that included my desire to throw small children off a bus. Although in my defense it was a noisy bar and I could have swore she said something along those lines, and not what she actually said which was more along the lines of doing a trust exercise with children that involves throwing them into pits of foam while volunteering to help out troubled children because she loves them so much. 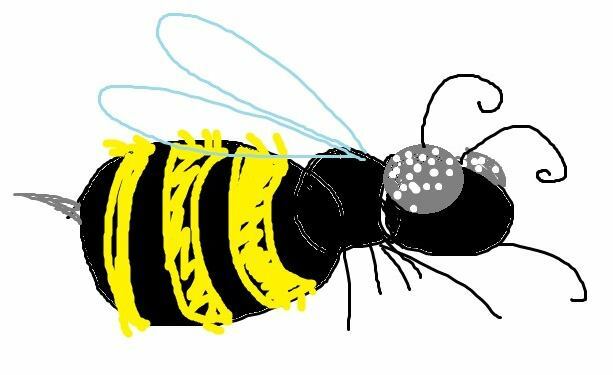 – This bee was contributed by Ana from Halifax. I think at this point it’s safe to say you’ll all notice when I run out of contributed bees and go back to drawing my own ha ha. Thanks Ana! This entry was posted in Bees!, Blog, Blogging and tagged 2012, Art, bees, blog, blogging, list, musings, pic, picture, story, true story. Bookmark the permalink. I should take up spreading false information on Facebook as a hobby. You are still in good form! Well done!